This Standoff Mount is Great for Communicating with Patrons in a Retail Store! These Sign Holders are Just a Sample of the Hundreds of Marketing Display Products this Site Has! Place an Order Now for a Standoff Mount! 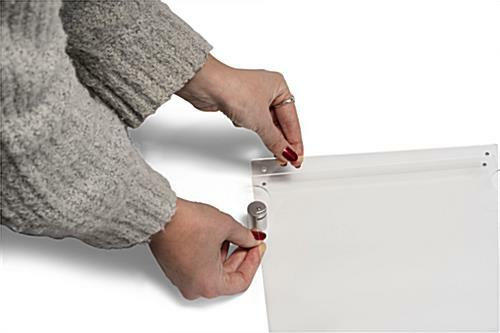 (2) Magnets are built into the fold-over acrylic panel to keep the top closed. 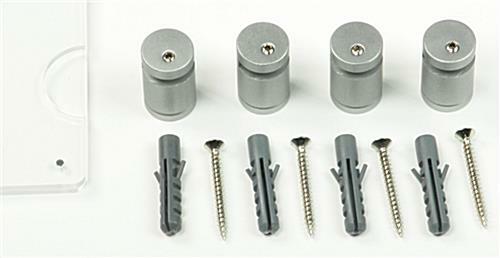 (4) Satin silver anodized aluminum edge-grip standoffs are included for mounting on a wall. 11" x 17" Posters easily slide into the top loading frame. This standoff mount with a satin silver anodized finish on the aluminum standoffs come with a clear panel for the signage. 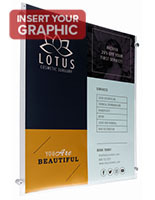 One of the best features of this wall display is that the unit is made for any type of paper. This standoff mount fits posters only in portrait format. 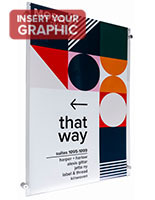 Each poster display is designed for displaying ads on a wall. This standoff mount is stylish to work in any environment, but the most popular places to find them are retail stores, food venues, colleges, and lobbies. The acrylic panels can exhibit a sign in any indoor establishment. 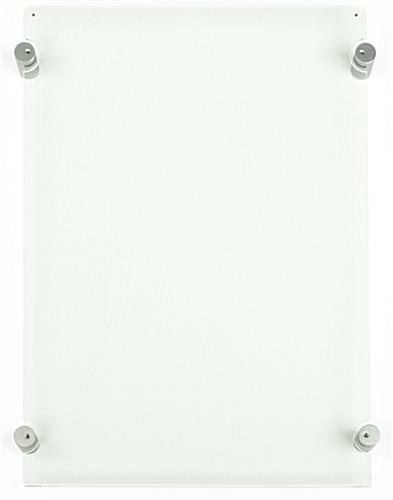 The sign holder with wall mounting hardware is reasonably priced for any sized advertising budget. 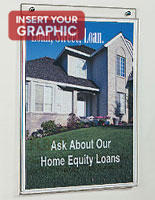 Communicate with clients in a business with this professional advertising display. 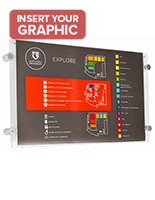 Each marketing display is a standoff mount that has a magnetic closure on the top of the acrylic panels to hold the unit closed. POP displays, like this standoff mount is made for quick updates. Users can change out the signage without having to take the unit off the wall. This standoff mount, called an acrylic panel, is great for any type of business. Each sign display is primarily used for sales flyers, menus, promoting new fashion lines, and more. Each standoff mount is for one 11" x 17" sign. Most standard printers will fit that size paper so there is no longer a need to go to a printing company for signs to be made. This sign holder for a business is a standoff mount that is easy to hang and includes all the needed mounting hardware. See the instructions below for details on how to mount the frame on a wall. Please Note: This sign frame holds prints in vertical format only. Due to the top-loading design and edge-grip standoffs, the format cannot be mounted in horizontal format. 12.9" x 17.1" x 1.3"